fc_PE = featureCounts(files=c(BAM1, BAM2), annot.ext=Merged.saf, isPariedEnd=True). Which don't really looks like a 0-count to me? So, what I'm doing wrong here? There might be something fundamental I've missed in the workflow I'm trying to conduct here? Maybe I'm using featureCounts in the wrong manner? Hi JB, I could not clearly see the peak names in your IGV figure but it seems your "Peak_3" overlaps with another peak, ie there is another peak in your SAF annotation that overlaps "Peak_3". 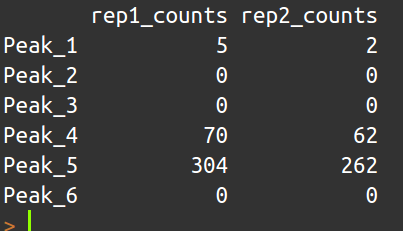 featureCounts does not count reads that overlap more than one feature by default and this might be the reason why you got zero counts for "Peak_3". You may set allowMultiOverlap=TRUE to allow featureCounts to assign multi-overlapping reads to all their overlapping features. Thank you for your quick reply. You are indeed correct about the cause of my problem. Sorry for the bad resolution in the picture. The two peaks that you see are overlapping and named differently. allowMultiOverlap=TRUE fixes this, but the real underlying problem in my case is of course the merge of the peak files. I want those two very close peaks to be merged as one. Turns out the problem was that I didn't have sorted peak files when using bedops to merge them. Your reply made me realize this, thank you!